I always love our visits with Tayla Gluck, DMD! She is always professional, super sweet with my son and is veryproficient! She always makes bringing a child to the dentist a breeze! I always love our visits with Tayla Gluck, DMD! She is always professional, super sweet with my son and is very proficient! She always makes bringing a child to the dentista breeze! She was very nice. This was my 3 year old's first dentist visit and she explained everything to him and allthe tools that she was using. I like how the office is so welcoming for children with lots of toys and TV and the walls are all painted with pictures so there's always something to look at. As of now, I see no reason to take my son somewhere else. She was very nice. This was my 3 year old's first dentist visit and she explained everything to him and all the tools that she was using. I like how theoffice is so welcoming for children with lots of toys and TV and the walls are all painted with pictures so there's always something to look at. As of now, I see no reason to take my son somewhere else. Make your child's dental experience a magical one! Hi! My name is Dr. Talya Gluck and I grew up in Long Island, New York. I attended Barnard College in New York City for my undergraduate degree and graduated with a minor in pre- medical studies and a major in American History. I continued my education at the University of Medicine and Dentistry of New Jersey where I received my DMD degree with honors. 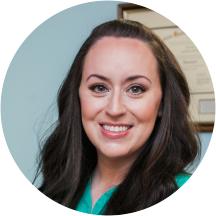 During my clinical training in dental school I realized my passion for working with children and special needs patients, and decided to continue my dental education and pursue a specialty in pediatric dentistry. I completed my pediatric dentistry residency at the University of Medicine and Dentistry of New Jersey, which included extensive academic and hospital training in pediatric medicine and dentistry. I currently live in Hillside, NJ with my husband and three children, where we enjoy our chaotic lives with our friends and family! I consider it an honor to be entrusted with the care of someone’s child. My goal is to provide excellent preventive and restorative care for children and guidance for their parents, to help children truly enjoy their dental visits, and to create a lasting dental home for families. Oral health is an essential part of a child’s well being and I look forward to providing dental care to children throughout their developmental years. We had a great visit for our daughter's first Dentist appointment and would highly recommend this office to anyone with kids. Our daughter can't wait to go back. Dr Gluck is fantastic. My daughter smiles and doesn't get upset about her cleanings. The office is so kid friendly and there's so much to do and see in the waiting area. It's truly geared towards kids and having a friendlyand positive visit. The staff is so friendly and Dr Gluck is extremely knowledgeable. I highly recommend this Pediatric Dentist to other parents. Dr. Gluck is amazing with both of my boys - and that's not an easy task. She is kind, thorough and patient, putting them at ease every step of the way. The office is impeccably clean, and a child's Paradise! Thereare iPads in the wall, game stations, tvs over the chairs, and prize chests. The staff is warm and accomodating. I would absolutely recommend her to anyone!! We looooove Dr Gluck and all her staff. We have never waited, we aren't even seating before we go into the exam room. She knows her patients, remembers important personal facts about her patients and, as a mother, she knows howto relate to children in a calming and soothing way. I travel over an hour to have an appointment with her. Sometimes we spent the night in the area to break up the travel time. Having a Dr you trust and that cares about you is priceless to me, especially with a toddler ! Excellent first dentist appointment for my two year old! He can't wait to go back!! Dr. Gluck and her staff are so nice, professional, gentle and patient with my two young boys. Dr. Gluck explained everything to me and my kids before she started working on them. She is very honest and caring. I will definitely recommend her. Dr. Gluck is truly wonderful with my toddlers. They feel comfortable during cleanings as she explains what each tool is for and what she will do. The facility is Magical with dragons, castle, etc. My boys love going there. Dr. Gluck was fantastic. This was my daughter's first treatment visit and I was so nervous for her. After a few tears in the beginning, Dr. Gluck knew just what to do to ease my daughter. She ended up doing great,which totally shocked me. Thanks to Dr. Gluck for calming her down and singing to her as she was getting treated. Definitely recommend Dr. Gluck!! She was amazing with my daughter and took her time to explain and make her feel at ease. Dr Gluck was patient, professional and proficient in everything that she did today. Her staff was warm, friendly and professional. The waiting room is so much fun that the siblings who were waiting their turn were very happy to wait. Trulya practice that loves kids and taking care of them like their own. Highly recommend! My son had his tooth pulled out and didn't even know it!! Today was my son's first ever dental appt. The office is awesome, decorated soo cute for kids and Dr. Gluck had a fantastic demeanor with my son! She picked up on his fear. She was sweet, gentle, talked him though everything,and even sang to him about fire trucks while she was brushing his teeth! I couldn't have asked for a better experience! Dr. Dan was great. You can tell he has kids and knows how to talk to little ones. My 4 year old left asking when we could go back. SUCCESS! We had a dentist that we liked for our daughter, but they didn't accept our insurance. Months later we started looking for a new dentists. After worrying it might be difficult to find another dentist, that we liked that accepted ourinsurance. As we knew our daughter needed to be seen again before school started. Going thru pages of dentists that accepted our insurance, I came across the BEST dentist for our daughter, Dr. Talya Gluck. As my daughter was "Super Nervous" Dr. Talya Gluck made my daughter's first and second visit VERY comfortable. She was very patient, caring, and explained everything to my daughter. Besides Dr. Talya Gluck being an excellent dentist, the office and staff were very friendly and caring too :) We are truly happy and PRAY they continue to accept our insurance. Christina D.
The entire experience was positive. From the moment we walked in and I have 4 young children (3 year old triplets and a 5 year old) was easy and pleasant. The office is stunning, clean and kid friendly. A children's paradise.Thestaff is the nicest I have ever met. And the Dentist was amazing. My kids LOVED going to the dentist, job well done. Thank you Montville Pediatric Dentist group!! My son loved Dr . Gluck!!! She explained everything and was so nice!! !